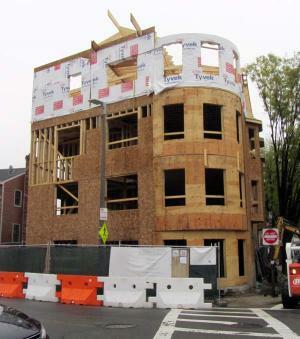 Under construction on Savin Hill Avenue: New housing units are easing the burden on older housing stock, according to city officials. Jennifer Smith photoCity housing officials say new data are revealing encouraging trends in the rental market for existing housing stock in Boston neighborhoods even as prices for homeownership and newly constructed rental units continue to climb. Statistics reviewed by the Reporter show a slight reduction in the cost of rental units housed in older properties as residents who can afford to are moving into new, higher-end units. “The city is very pleased that the increase in supply in Dorchester and other neighborhoods through Boston, is relieving some rental pressure on our older stock that has traditionally been available for our workforce,” said Sheila Dillon, the city’s housing chief. Anything built before 2011 is considered “existing stock,” historically the base for middle-income and family housing. Rents in properties built since then have risen by 18 percent across the city between 2015 and 2016, according to a “Housing a Changing City: Boston 2030” two-year snapshot report. “There’s really healthy growth and demand there,” said Department of Neighborhood Development (DND) spokeswoman Lisa Pollack. Across Boston, existing property rental costs dropped by 4 percent during that period, with the median older stock rental price in Dorchester dropping by 5 percent. The city’s latest analysis dives into detail on the neighborhood level. Dorchester was assessed in three chunks — areas around Neponset/Fields Corner, Uphams Corner/Savin Hill, and Four Corners/Codman Square. Since 2011, the city says 472 rental units have been completed in Dorchester, as have 174 ownership units. DND officials examined trends in studio, one-, two-, and three-bedroom apartments between 2015 and 2016, using rental data from Rental Beast and MLS and sales data from The Warren Group. Rents in studio and one-bedroom apartments from the older stock dropped significantly. Dorchester studio rents fell 13 percent between 2015 and 2016, averaging $1,400 compared to the citywide six- percent decrease to $1,600. An overall 17-percent rent decline in Dorchester one-bedrooms during that time was driven mostly by rents dropping by 21 percent in the Uphams Corner/Savin Hill area. In 2015, the median rent in the area was $1,650; it fell to $1,300 in 2016. The other two Dorchester zones started at $1,300 and $1,250, and both declined by about $50. The average two-bedroom rent for existing stock in Dorchester stayed steady overall, according to DND data, but Neponset/Fields Corner rents fell 8 percent to $1,525 and Uphams Corner/Savin Hill dropped by 4 percent while Four Corners/Codman Square rose by 4 percent. Two-bedroom existing rentals were the only area where citywide older stock price drops outpaced Dorchester, falling by 5 percent. Three-bedroom apartments were on the rise, however, inching up 2 percent overall for a Dorchester-wide median of $1,625. Home sale prices are now rising by about 11 percent across the city, with a median sale of $570,000. Dorchester’s trajectory is similar, with prices rising between 6 and 12 percent over the two years and median home sales settling between $410,000 and $459,500. Mayor Martin Walsh has laid out a plan to construct 53,000 new units of housing by 2030, and Dillon said the city is “meeting most of our goals.” All housing stock combined, including older and newer properties, has dropped in rental prices on average, according to city data. About 12,000 new units have come into the market since 2014, and city analytics are showing a strong response to new development. In Dorchester, rents fell in older studio and one-bedroom units, accounting for 31 percent and 40 percent of all new development respectively. Comparable new development of two-bedrooms has taken place, though data show neither a similar price drop nor rental increases for older stock in Dorchester. Only 10 percent of new development in Dorchester has been in the three-bedroom sector, where the slight increase has been seen. In areas dense with multi-family dwellings, like Dorchester and its signature three-deckers, rental prices tend to drive homeownership prices. When rents peak, that creates an incentive for investors to purchase entire houses and rent or sell them piecemeal, tilting the field against a family of four competing with three renting young professionals.